I professed to all of you my issue of lacking color earlier this week. This whole fall thing has thrown me for a loop and my brain flipped a switch somehow. I lost my urge for shades other than brown, black and cream. So, what does a girl do when she's feeling stuck on a neutral ground? She goes directly to the internet and does a little online window shopping. I chose seven hues from the Fall 2013 color palette list, that are on my list to either add or dig out of my closet for the upcoming season. I also did a little styling in my head and came up with some ideas on how to pair all seven color pieces with other fall trends that are on my radar. 1. I am picturing this fuchsia blazer from Target with the windowpane ankle pants that I wore in yesterday's post. 2. This emerald green satchel is ideal for adding a pop of color when wearing a basic printed shift dress. My choice? This little black and white number. 3. Speaking of shift dresses the one featured from Old Navy is a perfect foundation for layering as the temperatures grow cooler. Add an aztec scarf and pair of suede ankle boots for a polished, yet casual style. 4. For some reason when I wear any type of orange I immediately think of adding animal prints. What do you think about this leopard top with a pair of studded black ankle strap heels? 5. Acai (deep purple) is one color I don't own much of. I am not sure why because I love the rich and deep tone. Besides the obvious of adding black or white, I always lean toward mixing a golden yellow accent like a scarf or bag. 6. Bordeaux, Oxblood, Burgundy, Maroon (whatever word your choose) is back again this season. It's one of my favorites and this top with zipper accents would be killer with a pair of slim black leather pants. 7. Cobalt blue has all of a sudden become the new black. I have spotted several magazine ads, editorials and bloggers where this color was styled as a neutral. So, in my opinion, wear it any way you please...think of it as black. I know, it's sort of a new concept for me too. Did I skip over your favorite color for the fall? If so, tell me what I missed so I can add it to my list. Happy weekend everyone! See you Monday! I love cobalt blue! That color palette is making me so excited for fall. :) Have a wonderful weekend! Love Bordeaux and emerald for fall. Such a fun post Shanna! 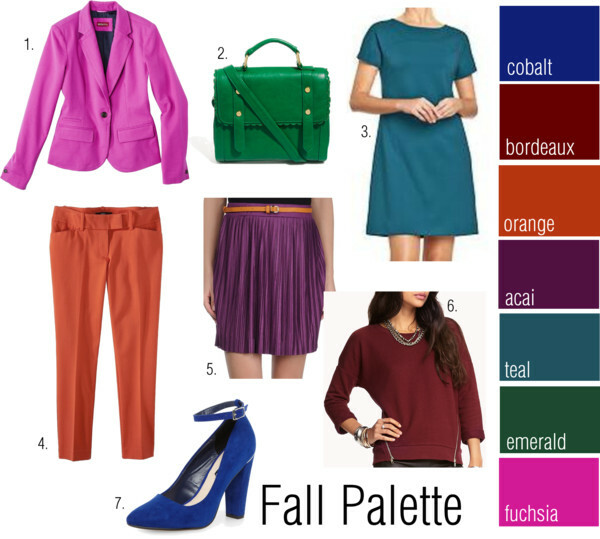 I'm dying to start wearing all of those bright jewel toned fall colors! And I love that blazer. LOVE this idea and your picks are spot on - I am on a mission to add more color to my closet too! Fuchsia is my favorite color! I want to start adding orange and cobalt blue to my wardrobe. I love oxblood too for the fall and acai looks interesting especially for lipstic. The dark purple color (acai) is one of my favorites. I don't think I own anything in that color, though. Need to go shopping! Love that pink blazer and I also have been eyeing that Old Navy dress! Perfect for fall! I think green is a great color for fall. I'm actually not too picky - I love it all! I'm loving cobalt. In fact I have a pair of cobalt ankle pants that I may see if I can still wear with a belly band after seeing this post. I need to learn I can wear things other htan maternity! I added cobalt blue, emerald green, and orange to my fall lineup so far! I'm loving oxblood + goldenrod for fall. Just saw the cutest top at Zara that I need to pick up. Would be fab on you! Loving these colors; I am totally a brown, black, and creme girl too! But I am LOVING the bold fall colors, especially fuchsia! Gorgeous! haha yes, i do like neutrals, but i love these bold pops of color! that blazer is to die for! hit the nail on the HEAD! anything bordeaux/maroon and olive is all mine for fall! All of the jewel tones are perfect for fall! Cobalt is one of my favorite colors to wear! Have a great weekend, Shanna! Absolutely in LOVE with the emerald and acai for fall. Also, I need those cobalt shoes. Like, now. Love all of these colors for fall. Fuchsia may be my favorite... or cobalt.. That blazer is fabulous. I've been wanting a bright blazer. May have to check it out! Have a great weekend! Love this, that pleated skirt is ADORABLE! Oooh...I love the teal, orange and emerald! Glad you found some color for fall!! Fall is definitely my favorite season for colors! I love burgundy and cobalt right now! Incredible colors! So happy to find your blog! I love wine and mustard colors for fall...year after year. I'm really excited about teal and eggplant this year too!! Definitely love orange and oxblood for fall, but I would definitely add mustard yellow to this list! Great picks! It's so hard for me to pick ONE favorite, but I really love all of these shades. They flatter most skin colors/hair shades as well, which is a plus for all us women! I'm SO ready for fall colors and layers! All of these are such beautiful choices.